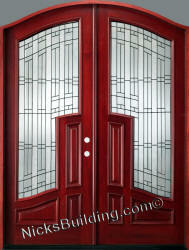 Our Exterior round top doors are offered at great prices. 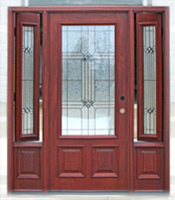 Our rustic radius top entry doors will astound you with top notch wrought iron hardware and impeccable fit and finish with a touch of Old World Charm. 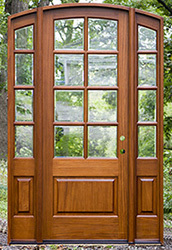 Many of our radius top doors are made with a lustrous African Mahogany Wood that will make your home the envy of the neighborhood. 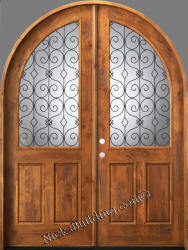 We Specialize in Round Top Doors, Arched Top Doors, Arched Double Doors and Rustic Wrought Iron Doors. 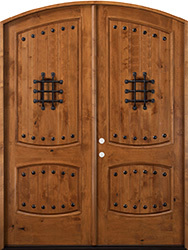 When you see a round top door on a home it really attracts your attention, is architecturally pleasing to your eyes and while it looks very expensive rest assured when you purchase from nicksbuilding.com you didn't spend a kings ransom for your arched top or round top door for your Castle. 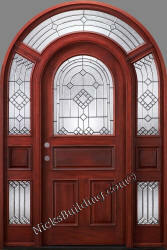 Did you know that every exterior arched door and round top doors you see are sold to you at wholesale prices? 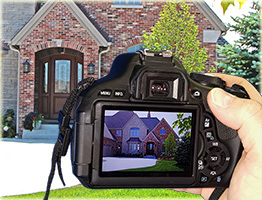 thus saving you thousands of dollars without a 3rd party or middle mans markup. 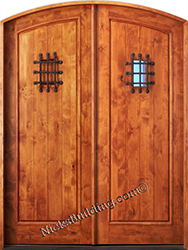 The big box stores who offer arched top doors of this quality is typically a "custom order" and will take 8 to 12 weeks for delivery and cost at least double. 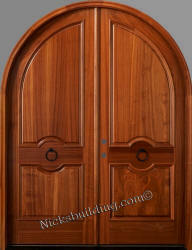 Buy arched top doors direct and save big money. 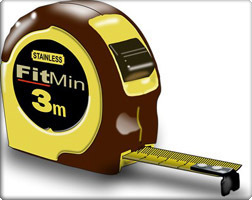 The selection is wide and we try to always have them in stock. 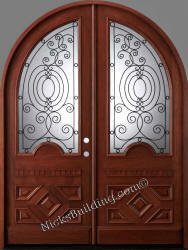 Arched doors create a look of elegance and style that just can't be obtained with standard doors. 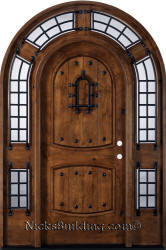 Unfortunately, arched-top doors are often billed as special orders by big-box stores and home-improvement chain stores. 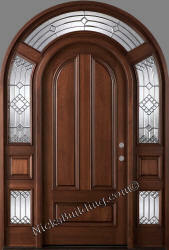 That means that the beauty you seek in the attractive curves of these doors will cost more, and you'll have to wait weeks for your doors to arrive. 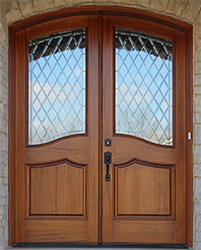 Nick's Building Supply knows that you want anything but this kind of experience when you're purchasing new doors, and we're here to help. 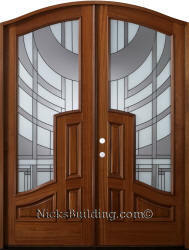 When you purchase your arched doors from Nick's, you're going straight to the source. 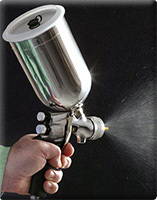 We offer our products at wholesale prices, cutting out the middleman mark-up and saving you thousands of dollars on your purchase. 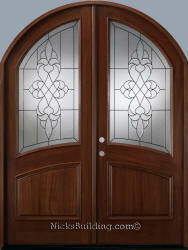 Just because your doors look like a million dollars, that doesn't mean they have to cost that much. 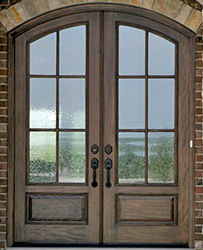 We're able to offer these beautiful arched doors at low prices because our factory manufactures them right here in the Midwest. You can order from us confidently because you know that your doors have been made locally out of quality products. 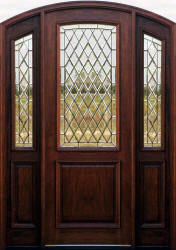 We construct our doors out of solid wood rather than pressed or particle wood. If you're ordering one of our standard arch-top doors, you won't have to suffer through the weeks-long wait as you would with a chain store. 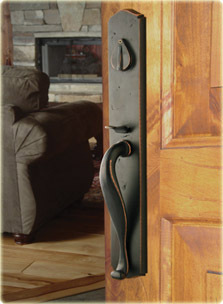 We know that the attractiveness of our doors is a hard thing to wait for. That's why we try to keep each style in stock so we can ship your order to you right away.